Galavant: cancel or renew for season 2? ABC recently unveiled something a bit different — a fairy-tale style musical comedy called Galavant. How’s it been doing in the ratings? Is the series a big success or is it hitting sour notes? Will it be cancelled or renewed for a second season? 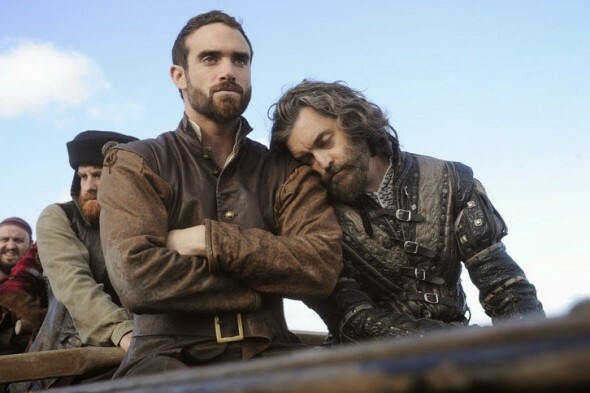 The network decided to air the Galavant’s eight half-hour episodes over the course of four weeks, to help fill the gap left by Once Upon a Time while that fairy tale show is on hiatus. The first pair of episodes of Galavant debuted on January 4th and drew a 2.0 rating in the 18-49 demographic with 7.42 million viewers. It was an okay debut in terms of the ratings. It wasn’t a hit but the numbers were on par with Once’s more recent ratings — and they were certainly far better than anything else ABC was airing that night. In week two, the ratings took a big tumble, falling to a 1.3 in the demo and 4.11 million viewers — likely in part due to the fact that NBC was airing the Golden Globes. The numbers for tonight’s episodes will probably be as bad or worse since they’re airing opposite the AFC Championship game on CBS. Still, while ABC could order a second season of Galavant (series creator Dan Fogelman has teased that the first season ends with cliffhangers), it doesn’t seem very likely based on the ratings. But, what do you think? Would you like to see Galavant return for a second season or do you think this musical comedy should be cancelled instead? Now that the second season is done, please give us a third! Three is the magic number, right, so that would be perfect for finishing this show. I felt a little wish-washy about the first season, but this second one was just about perfect and I loved every minute and every note of it. Please keep these people working together!